Brumley Arch is located in the La Sal Mountains near Moab, Utah. The Brumley Arch trail begins just past the half mile point of the Squaw Springs trail. From there it makes a steep descent into the canyon of Brumley Creek where there is a scenic waterfall as well as an arch. To get to the trailhead from Moab drive south on Highway 191, measuring from Center and Main, for 7.8 miles and turn left onto the Old Airport Road. Follow the signs for the La Sal Mtn. Loop Road for another 12 miles and turn right onto the Geyser Pass Road. It is about 2.9 miles along a graveled road to the trailhead. The Brumley Arch trail begins at the 0.6 mile point of the Squaw Springs trailhead on the Geyser Pass Road. The trail starts out heading west along the ridge. It only takes about a hundred feet of hiking before the trail begins descending the steep mountain side of the canyon. The trail builders engineered several switchbacks into the route to lessen the grade. They also buried numerous logs in the trail creating multiple series of steps. The trail comes to an end when it reaches Brumley Creek. The arch can be seen shortly before reaching the end of the trail but the view is somewhat obscured by the trees. If you would like to get right under the arch for a better look you will have to very carefully work your way down the creek and around a large boulder. The waterfall leaves a mist in the canyon that coats the rocks and makes them very slippery. Out of the thousands of arches around Moab Brumley Arch is one of the few that isn't found in a redrock formation. Even without the arch the scenic canyon with its ferns and moss covered cliffs is worth the effort. These pictures were taken in late August and the streamflow had tapered off quite a bit. The amount of water that flows through here in June and July is considerably more. With no path along the creek bed it can be awkward to manage. The waterfall has eroded itself deep into the side of the cliff. When the streamflow is low like it was when this picture was taken the waterfall can only be seen in several spots. Here is a short 28 second clip that should convey the canyons ambience. The hike back up the mountain side goes by pretty quick. The elevation gain is 362 feet and the one-way distance is only 0.4 miles. 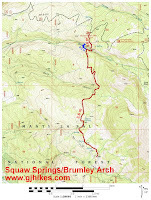 The hike between the Squaw Springs trailhead and where the Brumley Arch trail begins is 0.6 miles. That portion of the trail has a little elevation change as it passes in and out of the Brumley Creek drainage. 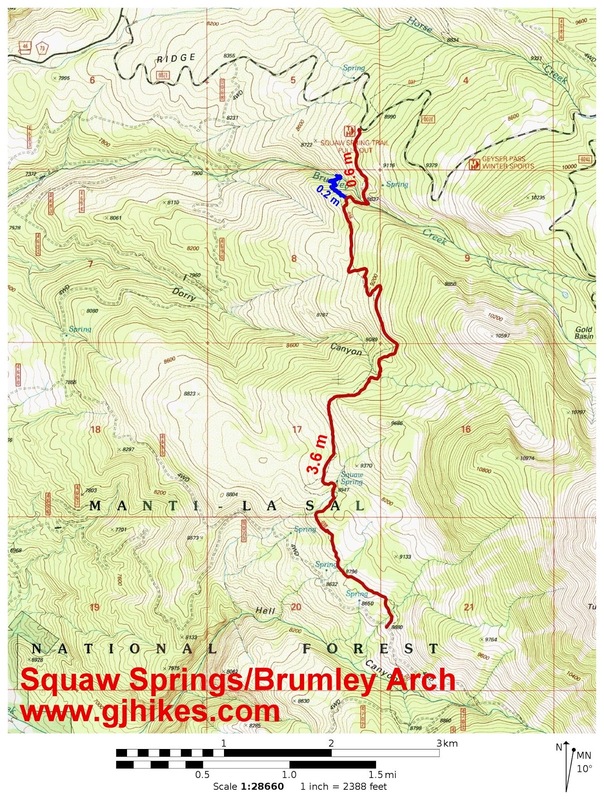 The overall round trip distance for Brumley Arch comes out to 2 miles after adding in the Squaw Springs component. When we took the pictures for this post we hiked the Squaw Springs trail all the way over to the La Sal Pass Road and then hiked the Brumley Arch trail on the way back. The Squaw Springs trail is also open to mountain bikes so a person could ride it and then hike Brumley Arch. If you would like to see it for yourself then all you have to do is 'Take a hike'.